Grant, we pray, almighty God, that by Saint Joseph's intercession your Church may constantly watch over the unfolding of the mysteries of human salvation, whose beginnings you entrusted to his faithful care. Through our Lord Jesus Christ, your Son, who lives and reigns with you in the unity of the Holy Spirit, one God, for ever and ever. St. Joseph and the Third Christian Millennium! | Rev. Regis Scanlon O.F.M. Cap. St. Joseph, the spouse of the Blessed Virgin Mary and the foster-father of Jesus, was probably born in Bethlehem and probably died in Nazareth. His important mission in God's plan of salvation was "to legally insert Jesus Christ into the line of David from whom, according to the prophets, the Messiah would be born, and to act as his father and guardian (Directory on Popular Piety and the Liturgy)." Most of our information about St. Joseph comes from the opening two chapters of St. Matthew's Gospel. No words of his are recorded in the Gospels; he was the "silent" man. We find no devotion to St. Joseph in the early Church. It was the will of God that the Virgin Birth of Our Lord be first firmly impressed upon the minds of the faithful. He was later venerated by the great saints of the Middle Ages. Pius IX (1870) declared him patron and protector of the universal family of the Church. St. Joseph was an ordinary manual laborer although descended from the royal house of David. In the designs of Providence he was destined to become the spouse of the Mother of God. His high privilege is expressed in a single phrase, "Foster-father of Jesus." About him Sacred Scripture has little more to say than that he was a just man-an expression which indicates how faithfully he fulfilled his high trust of protecting and guarding God's greatest treasures upon earth, Jesus and Mary. The darkest hours of his life may well have been those when he first learned of Mary's pregnancy; but precisely in this time of trial Joseph showed himself great. His suffering, which likewise formed a part of the work of the redemption, was not without great providential import: Joseph was to be, for all times, the trustworthy witness of the Messiah's virgin birth. After this, he modestly retires into the background of holy Scripture. Of St. Joseph's death the Bible tells us nothing. There are indications, however, that he died before the beginning of Christ's public life. His was the most beautiful death that one could have, in the arms of Jesus and Mary. Humbly and unknown, he passed his years at Nazareth, silent and almost forgotten he remained in the background through centuries of Church history. Only in more recent times has he been accorded greater honor. Liturgical veneration of St. Joseph began in the fifteenth century, fostered by Sts. Brigid of Sweden and Bernadine of Siena. St. Teresa, too, did much to further his cult. At present there are two major feasts in his honor. On March 19 our veneration is directed to him personally and to his part in the work of redemption, while on May 1 we honor him as the patron of workmen throughout the world and as our guide in the difficult matter of establishing equitable norms regarding obligations and rights in the social order. St. Joseph is invoked as patron for many causes. He is the patron of the Universal Church. He is the patron of the dying because Jesus and Mary were at his death-bed. He is also the patron of fathers, of carpenters, and of social justice. Many religious orders and communities are placed under his patronage. Patron: Against doubt; against hesitation; Americas; Austria; Diocese of Baton Rouge, Louisiana; California; Belgium; Bohemia; bursars; cabinetmakers; Canada; Carinthia; carpenters; China; confectioners; craftsmen; Croatian people (in 1687 by decree of the Croatian parliament) dying people; emigrants; engineers; expectant mothers; families; fathers; Florence, Italy; happy death; holy death; house hunters; immigrants; interior souls; Korea; laborers; Diocese of La Crosse, Wisconsin; Archdiocese of Louisville, Kentucky; Diocese of Manchester, New Hampshire; Mexico; Diocese of Nashville, Tennessee; New France; New World; Oblates of Saint Joseph; people in doubt; people who fight Communism; Peru; pioneers; protection of the Church; Diocese of San Jose, California; diocese of Sioux Falls, South Dakota; social justice; Styria, Austria; travelers; Turin Italy; Tyrol Austria; unborn children Universal Church; Vatican II; Vietnam; Diocese of Wheeling-Charleston West Virginia; wheelwrights; workers; working people. Symbols: Bible; branch; carpenter's square; carpenter's tools; chalice; cross; hand tools; infant Jesus; ladder; lamb; lily; monstrance; old man holding a lily and a carpenter's tool such as a square; old man holding the infant Jesus; plane; rod. A table overflowing with good Italian food honoring St. Joseph is a traditional Sicilian custom. The feast of San Giuseppe began in the Middle Ages when Sicily was suffering from a severe drought and the desperate people begged St. Joseph for rain. When they received rainy weather in response, they held a huge "feste" in Saint Joseph's honor. Even today, Sicilians go to Mass before their St. Joseph's day dinner and then process to their festive tables, decked out in flowers, breads, and all sorts of Italian foods. The priest blesses the food, and everyone shouts "Viva la tavola di San Giuse!" (which your children will readily do with great gusto). After the meal is done, everyone present is given something to take home, in the generous spirit of this day. Try some of our delicious recipes linked here. We especially recommend the traditional Minestrone. Italian sausage is always a favorite, as well. And you should have bread of all kinds — this recipe for Italian Decorative Breads can provide the traditional shape of your choice (St. Joseph's staff, his beard, etc). Also a traditional must with children is St. Joseph's Sfinge, (Cream Puffs), for which we have several recipes on this site. Plan a St. Joseph's potluck for this day with other Catholic families — invite a parish priest and ask his blessing over the food before you begin the meal. If you do not have the time or resources to do this, plan a smaller affair with your own family, complete with prayers to St. Joseph, a little procession with candles for the older children and your favorite hymns, and then the father of the family ought to say a special blessing over the food before you begin. Check out this wonderful site that explains the St. Joseph Altar more in detail, includes recipes, history, and allows virtual offerings. Saint Joseph Altars by Kerri McCaffety (Photographer). A Table for Saint Joseph: Celebrating March 19th with Devotions, Authentic Italian Recipes, and Timeless Traditions by Mary Anne Scanlan Grasso. The Saint Joseph's Day Table Cookbook by Mary Ann Giordano. Read the section of Directory on Popular Piety and Liturgy on St. Joseph. Read Pope Leo XIII's encyclical on Devotion to St. Joseph. Interested in history? 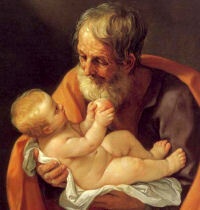 Read this article on the history of devotions to St. Joseph, Finding St. Joseph, by Sandra Miesel. Pray this prayer and litany in honor of St. Joseph with your family rosary tonight. Here is a link to several meditations on St. Joseph — choose the one that is perfect for you and your family! Here are some ideas for teaching children about St. Joseph. Young girls ought to pray to St. Joseph for their future spouse. St. Balbina was a virgin and martyr (130) and the daughter of the tribune and martyr, St. Quirinus. The church is one of the oldest churches in Rome, and was probably built in the 4th century above the house of the consul Lucius Fabius Cilone. The first reference to it is found in a 6th century document, where it is referred to as Sanctae Balbinae. It was consecrated by Pope St. Gregory the Great.